The Islands of Hawaii are about 2,500 nautical miles off the coast of California. Hawaii consists of eight main islands and was the 50th State to be added to the Union (see more fun facts below). 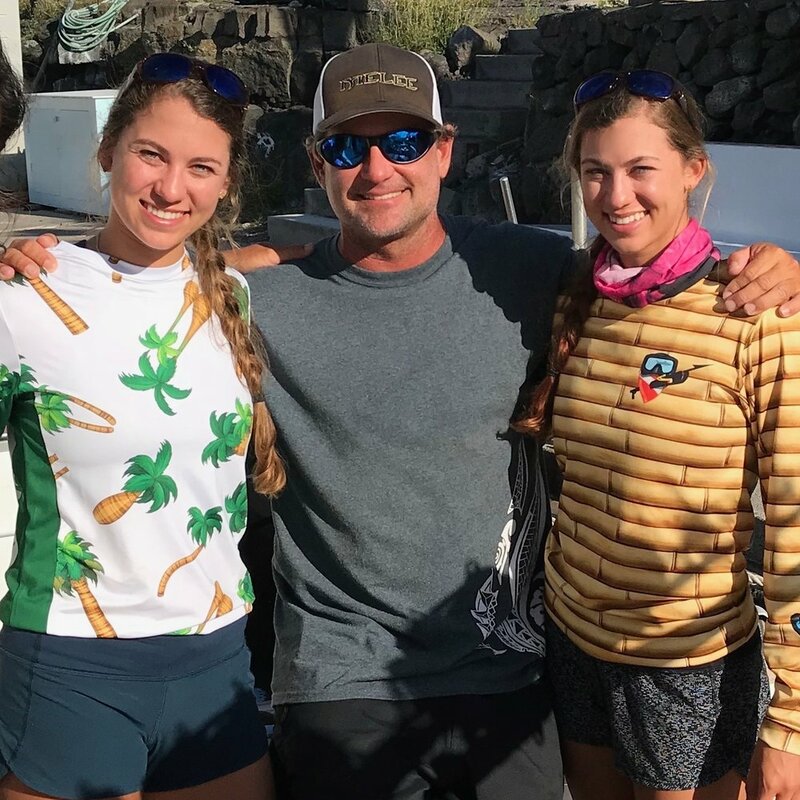 When my sister Captain Amanda and I fished in Oahu about a year ago, we heard that Kona was a great spot to find big blue marlin - we knew we’d be back - but didn’t realize it would be so soon. We were corresponding with Captain Mike Tan who runs his own charter business, Bluesails Sportfishing out of Malaysia. Mike had a trip planned to fish the big blues in Kona and invited us along. We were given the opportunity to fish on the Melee with Captain Bryan Toney and his mate, Captain Richard Creed. Captain Bryan Toney, originally from Florida, moved to Hawaii at the age of 22 to chase big Pacific blue marlin. In 2015 he broke the women's all-tackle blue marlin world record at 1305 lbs. He fished for 50 days out of the Ascension Islands with only two bites before getting that world record! This gives a new meaning to why it’s called “fishing - not catching”. But any fisherman will tell you that searching and waiting is all a part of the process of finding these billfish. Bryan can be counted among the best in the world. Captain Richard Creed is a talented fisherman originally from South Louisiana and an alumnus from LSU. We bonded over Tony Chachere’s Cajun seasoning and our mutual love for the state of Louisiana. When Creed is not fishing in Kona, he's running his 31’ Bertram in the Gulf of Mexico fishing for yellowfin tuna, marlin, and the like. Amanda and I enjoyed spending our time with Creed. We are so appreciative of all the knowledge that he shared with us. After 7 years of being a banker, Captain Mike Tan switched gears and pursued his dream of becoming a fisherman. Fifteen years later, he is running a successful charter company, Bluesails Sportfishing, out of Malaysia. Mike being an accomplished angler himself has fished around the world with his high-energy and focus. He shared our excitement, standing alongside us when we hooked our first blue marlin! He was genuinely happy to celebrate our success. With five licensed Captains all aboard the Melee, we knew it was going to be a great time. Day One: The first day of fishing saw a lot of action with a total of 4 bites and 2 releases between 11 am and 4 pm. The first bite we had was Amanda’s fish. After the initial run, the fish acted lazy almost as if it didn’t realize it was hooked. She continued reeling while we all looked at each other half questioning if we still had it. Amanda kept at it because there is always the possibility that the fish is swimming towards the boat putting slack in the line. Just seconds later, her fish began to fight. It was estimated to be around 150 pounds. Once it was in reach Mike leadered the fish while Creed removed the hook and released it. There it was, the first blue marlin for the Gale Force Twins! On day one we both released our first Pacific blue marlin making it a success! Days Two and Three: The following two days were slow, we went 0 for 0 and 0 for 1. We weren’t troubled as it can be common to have slow periods of fishing in Kona. We spent the lulls snacking on animal crackers and Cheetos while Creed made three cheese paninis. For us it was about more the whole experience; not just catching marlin but spending time with the crew, learning their methods of fishing, and of course telling fish stories. We expected a few slow days but were not disappointed. On the contrary, it was an enriching experience. Mike kept us laughing by putting $20 bills in the reels for good luck! Day Four: Thankfully on the fourth and final day, the fishing picked up. Early morning, Creed put the spread out and rigged the right short with same lure that Captain Bryan caught his record 1305-pound blue marlin on! We were excited to have that purple lure in the spread and it didn’t disappoint. Around noon Amanda hooked and released a 175 pounder, on the right short. The end of the day was closing in but I remained hopeful that another blue marlin would make a last-minute appearance. At 3:50 pm Creed looks over and says, "Just watch, we are going to get a big one in the last ten minutes.” Sure enough at 3:55 the right short offered up its reward, and we had a FISH ON! I jumped in the chair and clipped myself onto the reel. Capt. Bryan Toney started backing down on the fish before the spread was even cleared. That's when I knew it was a big one. The fish took drag for nearly 5 minutes before I got a chance to start reeling. I had a good fight on my hands with a 400+ pound fish! We battled the fish for another 10 minutes until she pulled the hook, leaving me a little deflated. On the upside, everyone in the boat feels the emotions with you, both good and bad. It’s a nice consolation knowing the experience was shared. Although she got lucky this time, we will be back taunting the deep waters of Hawaii again. Final Thoughts: Captain Amanda and I went to Kona with a goal of getting our first Pacific blue marlin and we are pleased to have accomplished it. We want to thank the crew on The Melee for putting us on the fish and giving us an incredible experience. There is no doubt that we will be back as one of our goals is to complete the IGFA Billfish Royal Slam. 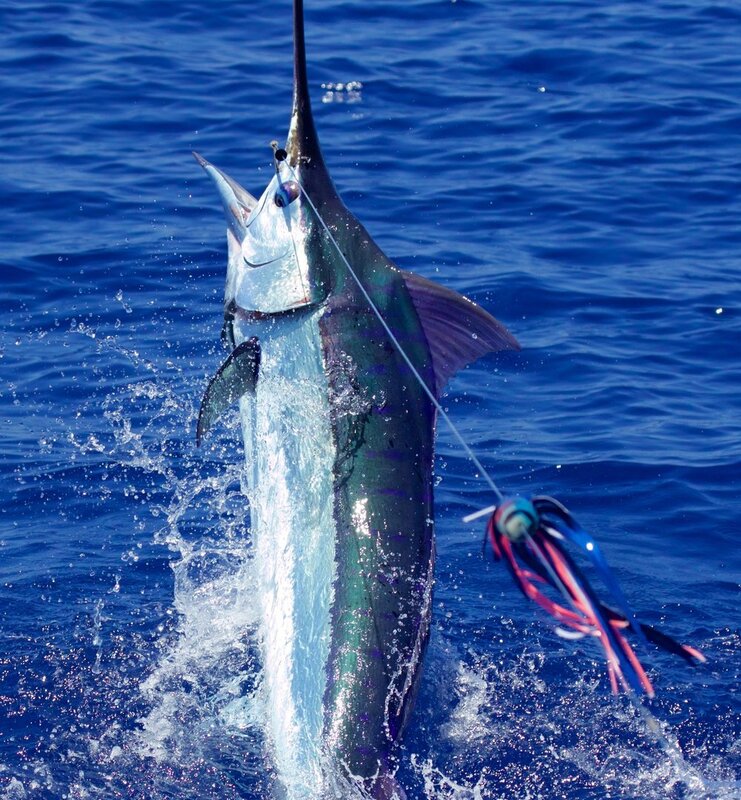 The Billfish Royal Slam consist of an Atlantic Blue Marlin, Pacific Blue Marlin, Black Marlin, Striped Marlin, Atlantic Sailfish, Pacific Sailfish, Swordfish, and Spearfish. Learn more about Captain Mike Tan at rompinbluesailfishing.com, Captain Bryan Toney @konagrander, and Captain Richard Creed at Third Coast Bluewater Outfitters. Hawaii consists of eight main islands: Niihau, Kauai, Oahu, Maui, Molokai, Lanai, Kahoolawe and the Big Island of Hawaii.